PROJI is an alarm clock with projection in a sleek, contemporary design with radio controlled clock. Easy to read from the ceiling and simple! 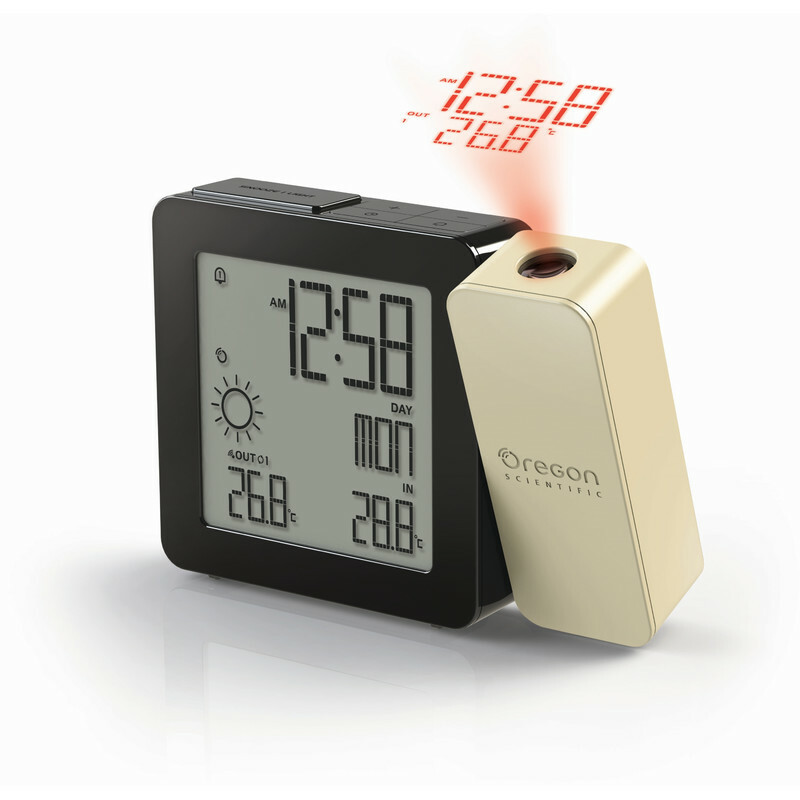 The LCD display shows the time, date, the indoor and outdoor temperature and weather forecast in a large font to easily read. Thanks to the radio-controlled clock You must set the time more! BAR368 receives the time and date of the atomic clock. Also in the summer time is switched automatically. Why in the dark or switch the light on, just to see the time? The adjustable projection arm with 180-degree image rotation allows the projection of the time and outdoor temperature onto a wall, the ceiling or at any angle to eye level. With a simple tap on the SNOOZE / LIGHT button the time and temperature is projected on your wall or ceiling. simply operate the clock with the included AC adapter for continuous projection. Will you like to see whether it is worthwhile to slip out of the warm blanket and get up? This projection clock measures the Zimmertempartur! Need today an umbrella or a hat? The weather station clearly shows the weather forecast for the next 6 hours ago via wireless outdoor sensor (included) and will help you to plan your day. The dual alarm function allows you to set two alarm times on a clock, for example, on weekdays or weekends.